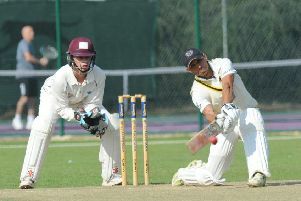 Saranga Rajagury during his innings of 60 for March against Kimbolton. Photo: Pat Ringham. Matthew Ingram made it three tons in four innings for Oundle Town seconds in Northants Division Two by blasting 142 in defeat at Geddington. Alistair Pike couldn’t be blamed for Uffington’s six-wicket defeat at the hands of Billingborough seconds in South Lincs Division Two. The opener cracked 120 of his side’s 180 and took two wickets in Billingborough’s reply. Peter Rowe during his innings of 91 for Ketton Sports against Barnack. Market Deeping were easy winners in a battle of two unbeaten teams in Division Two. Deeping skittled March for just 137 before scooting home by six wickets. Meli Adatia and Danny Holden both took five wickets for the winners. Deeping are now 48 points clear of second-placed Castor who beat Uffington by three wickets thanks mainly to a terrific 6-35 spell from seamer Stuart Dockerill. Dockerill also finished on 27 not out.